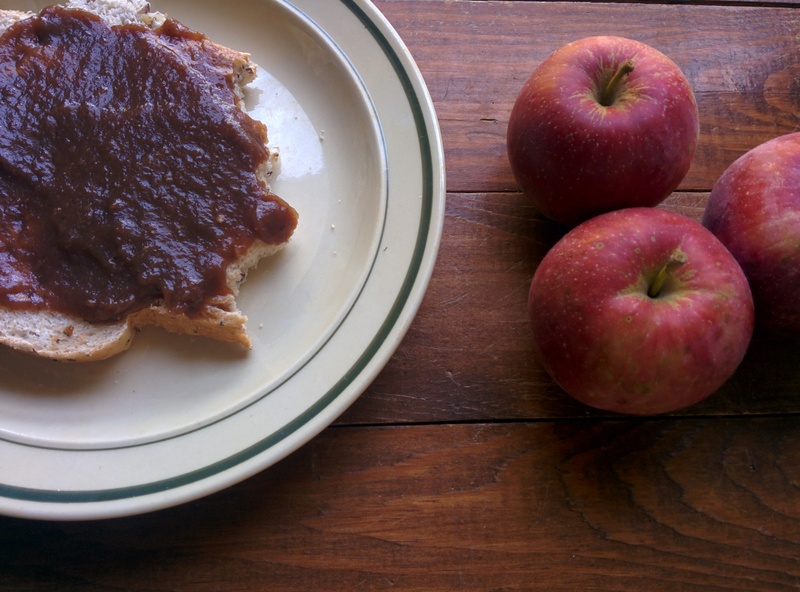 I am sad to say that I have never made apple butter before 3 days ago. Yes I used to have a huge apple tree that had more apples then I needed. 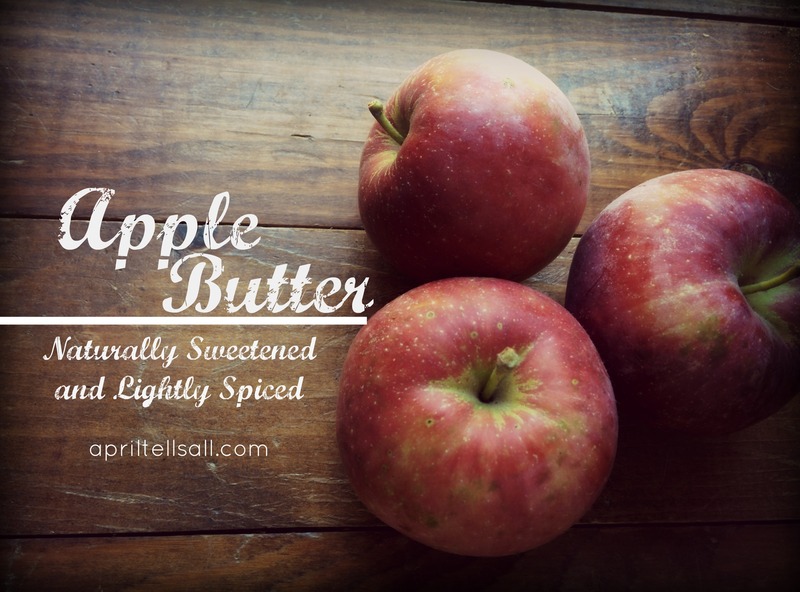 No I never made apple butter. Which is really strange because, not only is it fantastic, it is borderline unworthy of calling a recipe as it only requires a grand total of 10 minutes of active work. Including clean up. I use a slow cooker for this recipe and a food processor. The most work I had to do was slice and core the apples. I didn’t even peel them, that’s just how simple it is. 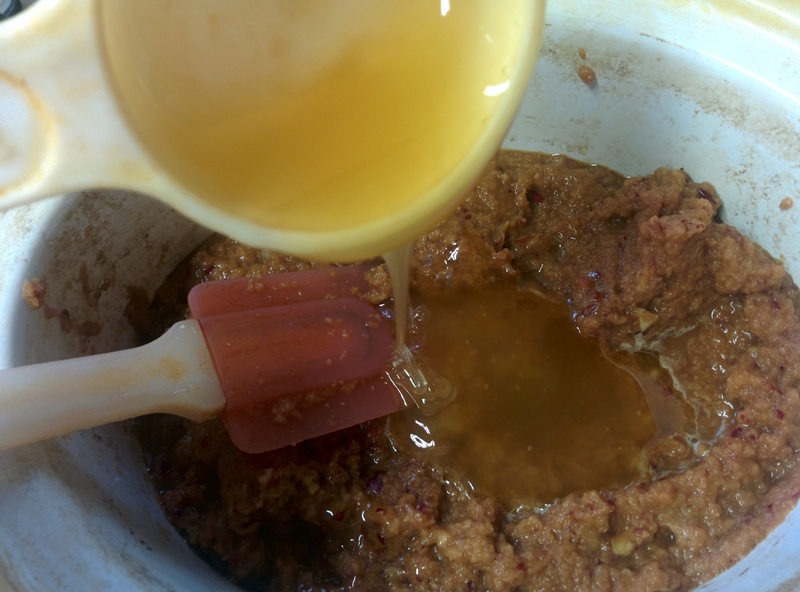 1/4 cup – 1/3 cup of honey – this all depends on how sweet your apples naturally are. I used Spartan apples and they were quite sweet on their own so I only used a 1/4 cup of honey. 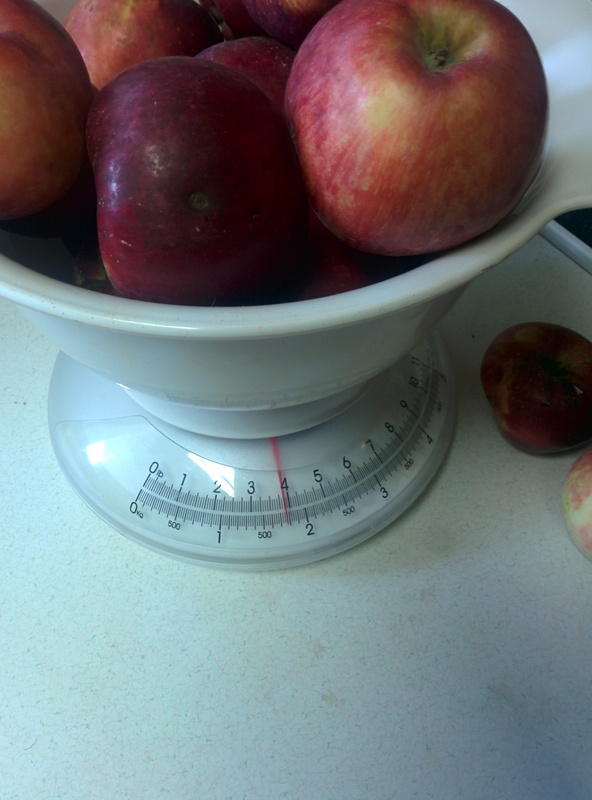 Step 1: Slice and core your apples and put them into a food processor. I didn’t bother to peel mine because 1. who needs more work and 2. they were pioneer apples as my Grandpa would say. If your apples have been exposed to pesticides you will probably want to peel them. Step 2: Mulch the apples in a food processor. My food processor is a mulching machine. I only use it on low as I’m pretty sure it would achieve lift off if I cranked her up to high. A good 3 minutes on low speed was enough to turn those apples into goo. It may take longer if your food processor isn’t into destroying food quite as quickly as mine is. Be sure to scrape down the sides now and then to get all those apples worked in. Step 3: Put the mulched apple goo into a slow cooker. Add the honey, cinnamon, cloves, allspice, and lemon juice. Stir to combine. 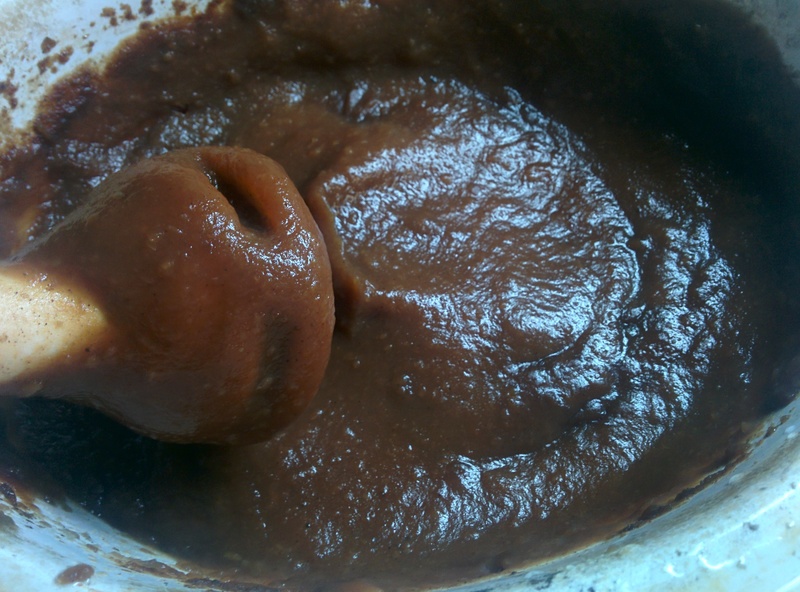 Step 4: Cook the apples on low, stirring every once and a while until the apple butter is cooked down to your liking. I was going for a smooth velvety consistency so mine took 4 hours. Again this will also depend on the type of apple you’re using as some have more juice then others. 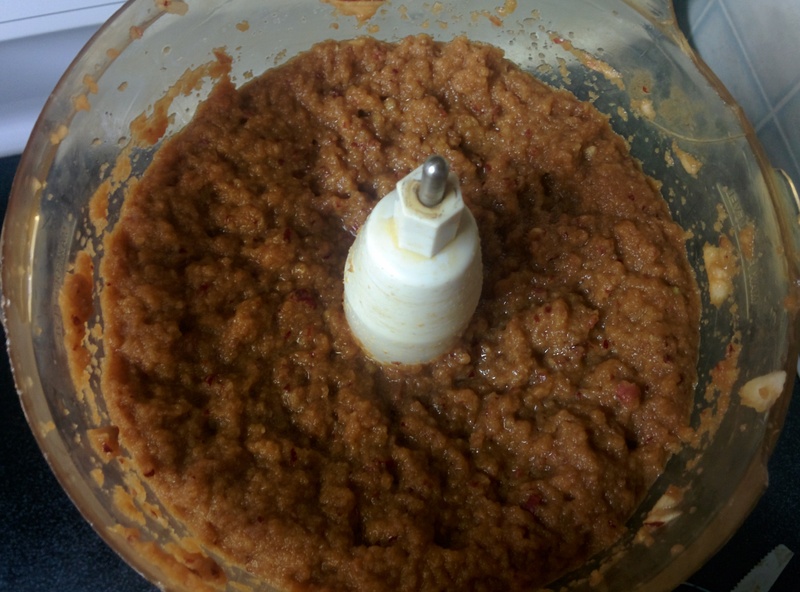 Step 5: Once done cooking, puree with an immersion blender to get it to that awesome consistency. Step 6: Pour into 1/2 pint or pint sized jars and fasten with lids and rings. You can water bath can them for 10 minutes or just do what I did and put the jars of apple butter in the freezer after they’ve cooled (be sure to leave enough room for expansion). Next time I make this I may make a triple batch and can it. Smear it on english muffins, or a fresh piece of bread. Stir it into your oatmeal or yogurt. Pour over cheesecake, smear on an oatmeal muffin (I’ve been into oatmeal lately). It would even be good in a smoothie. The possibilities are endless! Now that’s my kind of food. Shared with Our Simple Homestead Blog Hop.